With an assistance of Handy Backup, you can always save any data governed by Magento CMS, both as static-type FTP content and as a dynamic data kept under any database engine. This technique is quick and reliable, requiring up to no tuning for different Magento versions. Strong data protection, allowing encryption as well as using SFTP or FTPS protocols. How Frequently You Need Backing up Magento? This is a matter of your personal backup strategy, although we recommend to backup Magento every day (at least, every workday), as well as to create a separate Magento scheduled backup to a different data storage at least once or twice a week. Please follow the next steps to create a task ensuring the effective Magento automatic backup. Open Handy Backup and create a new task by clicking a button on a management panel or by selecting a “New task…” item from the main or context menu. 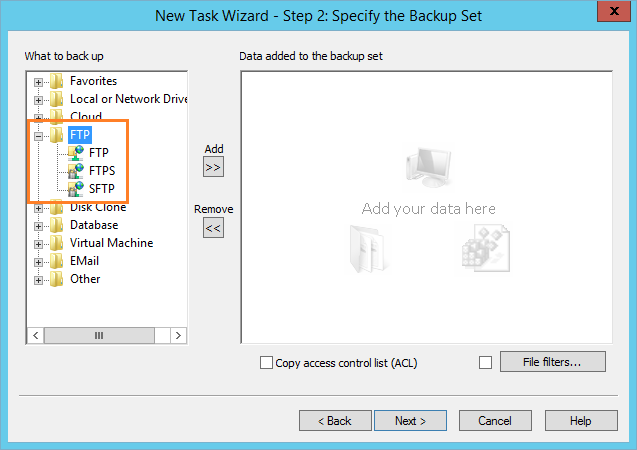 Choose a backup task, and proceed to the Step 2, where you can select data to be backed up with this task. 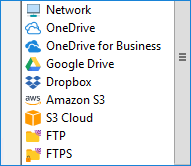 Click on FTP, SFTP or FTPS option, according to your website connection type. A “New configuration…” string will appear. 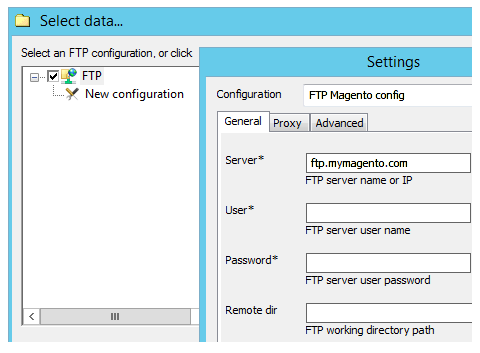 Double-click the “New configuration…” and enter all the connection parameters for your FTP access to the Magento website. Test the connection and press “OK”. Then select data you wish to save as Magento backups. You can mark or unmark checkboxes before each data item to select or deselect these particular data. When you are finished, press OK and return to the data sources window. If you are also planning to perform Magento database backup, select the particular database type on the Step 2 and set up backup parameters. Note: This step is described in details for each database type, including generic ODBC-based connections, in corresponding sections of the User Manual. Now select the data storage where you will keep your Magento snapshots. If this storage is of online type, please ensure firstly than you can connect with this storage without problems. Please check also that your selected storage media has enough space for backups! On the next step, choose the backup type (full backup, incremental, differential or mixed). As website content and, especially, databases can change very quickly, we recommend to use differential backup instead of incremental backup for these purposes. For full backups, you can also set up the parameters of versioning. Again, please check if your data storage can support the size of some versioned CMS Magento snapshots. The Step 5 contains the parameters of encryption and compression. Select and tune these parameters if you fill a need for it; otherwise, skip this step. On the Step 6, you can program your task as the Magento scheduled backup sequence. Set the frequency of execution for this task (maybe according to the rules we provided before). Moreover, the last step is to give a name for your task. This is all. Your task is ready for both manual and automatic execution, according to your will. Enjoy the safety of your Magento data! To save all your website information, please do the sequence of actions according to the following video. You can create a restoration task using the same sequence as for backup task described before. Naturally, for the restoration task you must firstly select the backup storage, and then the destination for each restored component. Note: These destinations may be changed from original, allowing replicating and mirroring Magento sites at will. Just select the different destination for your data and configure the access rules to this new destination if the need for it will emerge. You may also use any Magento data just from backups as any other file (unless, of course, you pack these data with encryption). 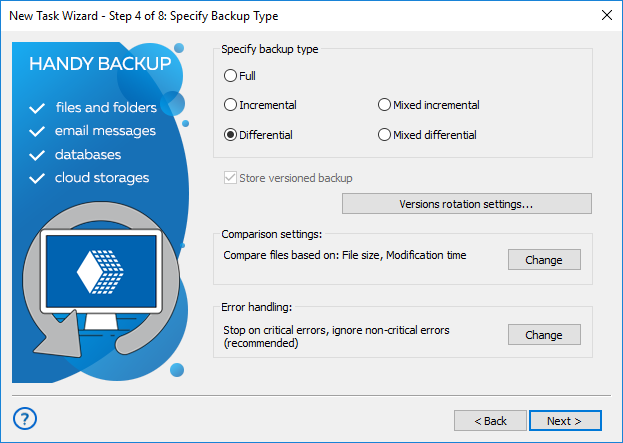 As mentioned above, Handy Backup uses native data formats for any backup information, allowing operating with saved files and folders using standard tools. 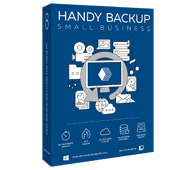 For Magento backups, you need to use the Handy Backup Small Server edition. As a comparison to Handy Backup, we collect some other typical methods backing up data from Magento websites and/or DBs. For a grief, all these methods have some flaws or troubles absent in Handy Backup, making using of these methods much less comfortable and safe. Magento contains a built-in instrument for backup and restoration. This method is safest, fullest of these other backup ways described here. All the user need to apply this tool is to learn how it works and set up the operations according to the preferred backup strategy. The main problem with this method is the strict Magento orientation, allowing backing up no other data than Magento web content (compared to backing up any data type in a single task for Handy Backup). A choice of data storages is also somewhat smaller than in Handy Backup. Some extensions, e.g. Magento Database Backup extension (tagged at $130) and many other, can selectively wide the functionality of Magento backup. The consideration is the same as from the built-in Magento backup tool; for this price, the usability is highly limited compared to Handy Backup. Instruments like PHPMyAdmin or some bash backup script can serve as Magento snapshotting tools. Depending on the skills of a system administrator and on the script quality, these tools can satisfy the needs of saving copies from CMS Magento. The main problem of these tools are that automation is not guaranteed by some degree. 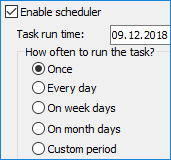 Therefore, users must either operate with these instruments manually or ensure the time-scheduling functions are working correctly in these scripts. Otherwise, some data losses can be expected. You can always use any Magento backup module. These external modules and software solutions are often commercial, with a significant price tag. It can be the only flaw for these solutions, not mentioning the same functional restrictions for using with Magento only. For example, the MageBackup module presented at http://magebackup.com has a serious functional restriction of 1 allowed domain only for a free version. The full version, able to save only Magento data, cost at $299, which is much more than the universal Handy Backup Small Server! Try Magento backup with a latest version of Handy Backup, downloading a 30-days trial without any restrictions just now!